Country life in the Dutch Republic can be said to have started in the village where Loekie and I have lived for fifty years. The protection from overdevelopment that we enjoy had its origins in the conversion of farmhouses to country homes in the 1620s. Looking more closely at the circumstances, Schwartz finds that the impulse to do so came from two Amsterdam brothers-in-law, out to impress their wives’ wealthy father. Last year Loekie and I celebrated the jubilee of our residence at Herengracht 22 in Maarssen. Here is the house – the 5-bay center house of a block built in 1725 – when we moved here, with our deux-chevaux in front of the door. And here a more glamorous photo taken in January 2018, with a full reflection in the Vecht River. The chestnut tree on the right that had been planted before our time to match the one on the left, after its predecessor had died, has grown nearly to full height. And the palmtree transom above our door was discovered by Loekie about forty years ago in a historic building supply firm in Noord-Holland. Regular paint jobs, maintenance and some heavy-going conservation create the impression that the façade is much the same. 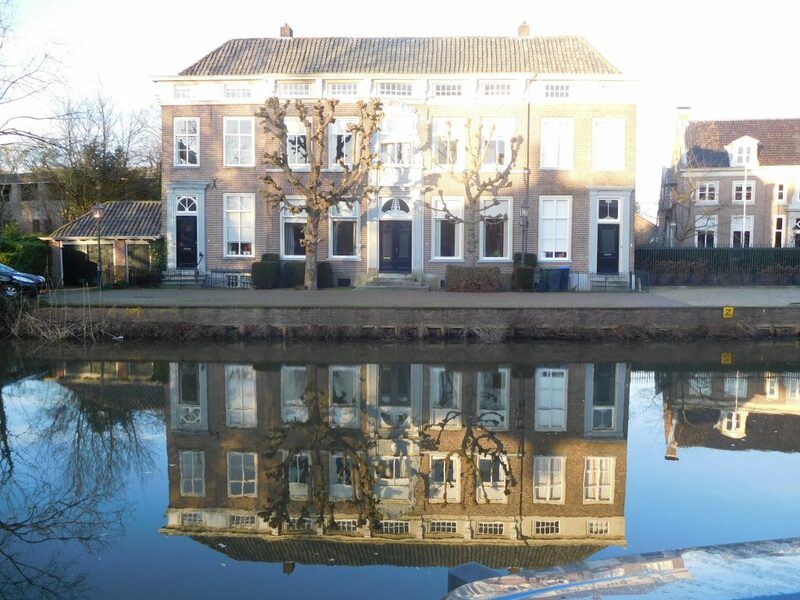 That historic houses in Maarssen can be lived in this sustainably does not speak for itself. The pressure for large-scale development in a choice location in the Randstad – the urban configuration in the west of the Netherlands – is unrelenting, and history cannot always resist it. What we didn’t know when we bought the house in April 1968 is that it was threatened with demolition to allow for the building of a bridge that would have separated it from the village, a plan that was fortunately in the process of being revoked. If Maarssen has an advantage over other small towns in terms of monument protection, it is thanks in considerable measure to the competition between two Golden Age brothers-in-law in the 1620s. Their houses on the Vecht flanked ours half a kilometer upstream and a bit further downstream. The big green oval encircles Goudestein (Goldcastle), the country power estate of Joan Huydecoper (1599-1661). The red one gives the location of Huis ten Bosch (House in the Woods), owned by Pieter Belten (1605-40). And the modest white form shows where De Boomgaard (The Orchard) lies, where we now live. What made Joan Huydecoper and Pieter Belten brothers-in-law is that each of them married a daughter of the legendarily wealthy Flemish immigrant Balthasar Coymans (1555-1634), Joan with Maria in 1624 and Pieter with Constantia in 1627. As it happened, both men came to own the properties in Maarssen we see on the map in the very year of their marriages. Joan inherited Goudestein from his father in 1624 and Pieter bought Huis ten Bosch in 1627. When they acquired them, both houses fell under the description of a hofstede, the dwelling of a farmer with a bit of means. What the young men did next is what it’s all about. In what I take to be a compliment to their new father-in-law, they emulated, at their own far lower scale, in a mere village, the stylistic preference he was showing off in the world financial capital of Amsterdam. In 1625 Balthasar took on the young architect Jacob van Campen (1596-1657), who was later to become the leading exponent of classicism in Dutch architecture, to build a mansion for him on the Keizersgracht. 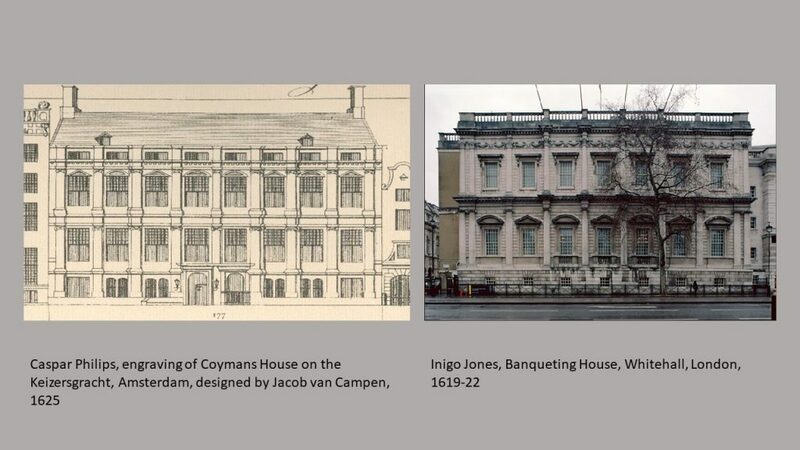 Balthasar was no piker, and thought it perfectly fitting that his house be modeled on the Banqueting House that Inigo Jones had just finished for the king of England. Although there is no documentary proof for it, there are no other candidates than Jacob van Campen for the builder who helped Joan and Pieter to radically make over their farmhouses in Maarssen. 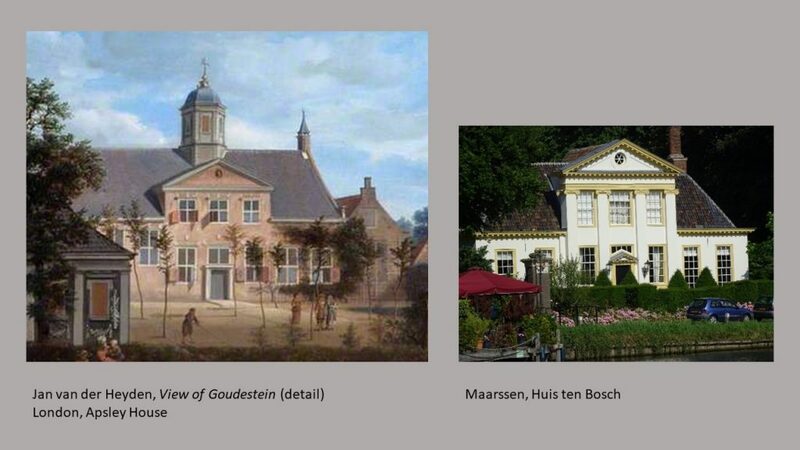 Joan’s Goudestein was replaced in the 1750s by a more fashionable successor, but we have paintings and prints by Jan van der Heyden to show us how closely its façade resembled that of the still extant Huis ten Bosch. The facades that the brothers-in-law proudly appended to their village getaways outdid anything else the Dutch countryside had to show at the time. Look at those classical pediments rising high over the lower wings, at the near-identical division of windows, walls and door. They looked even more alike before the tower that belonged to Huis ten Bosch was taken down. These hofstedes 2.0 announced the arrival of the Amsterdam upper class on the doorstep of Utrecht, an area dominated until then by the medieval chapter houses of that city. That the actions of the bros-in-law were competitive I deduce not only from what I know about the superassertive character of Joan Huydecoper but also from the added distinction Pieter Belten gave to his later house, with pilasters and an Ionic order lacking in Goudestein. 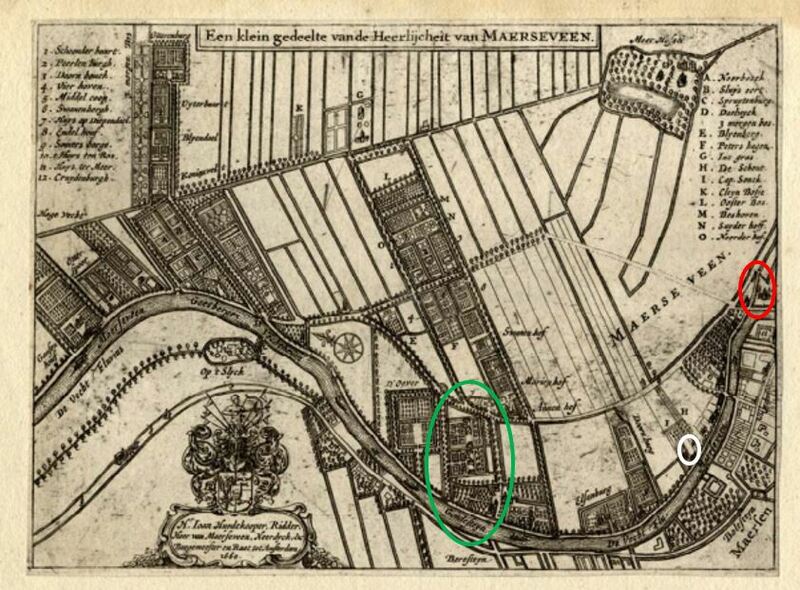 And look at Joan’s revenge, in the map of Maarsseveen, above, that he had made in 1660. (Maarsseveen was the neighboring polity of Maarssen, to which Joan had finagled seignorial rights in 1640.) “A small section of the seignory of Maarsseveen,” it is captioned, in a simultaneously under- and overstated locution. Joan’s Goudestein is featured front and center, while the nearly equal-sized estate of the late Pieter Belten is squished into a margin at the right. This chain of events and its cast of characters has a lot to do with my intense enjoyment of my house and surroundings of the past fifty years. Joan Huydecoper’s ambitions in Maarssen led him to purchase as much of the best riverside land on the Vecht that he could get hold of and sell it to relatives and cronies from Amsterdam. He underpinned this campaign with cultural expressions of all kinds. The poetry of Jan Vos and Constantijn Huygens, the mapmaking of Jacob Bosch, the painting of Jan van der Heyden, the prints of Roelant Roghman all helped in a decade or two to turn Maarssen into the very definition of Dutch country life. 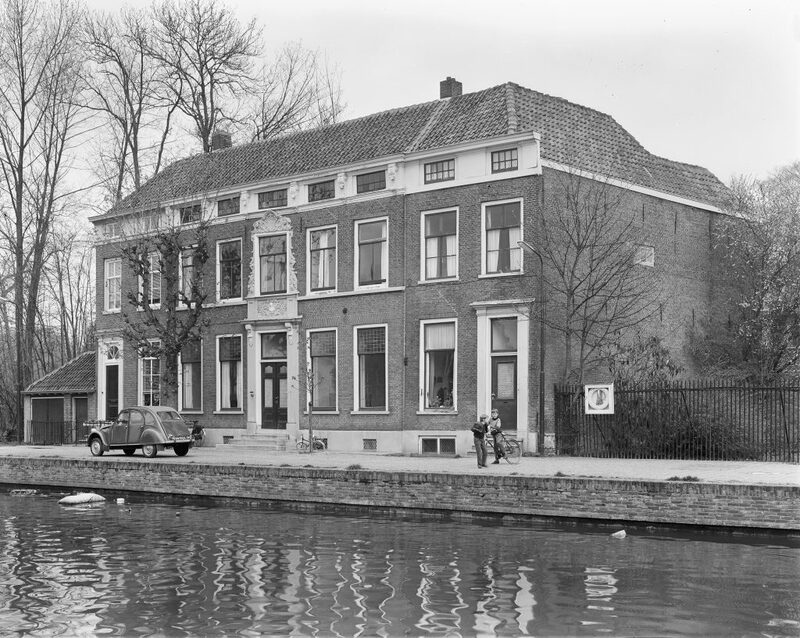 Although two-thirds or so of the former country houses on the Vecht are gone, what is left enjoys protected status under monuments legislation and is therefore a brake on bottom-line maximizing of utility and return. Long may it last. © 2019 Gary Schwartz. Published on the Schwartzlist on 14 April 2019. See too my article of 1983 on Joan Huydecoper in Maarsseveen. Responses in the Reply box below (these will be viewed by all visitors to the site) or personally to Gary.Schwartz@xs4all.nl are always appreciated and will be answered. 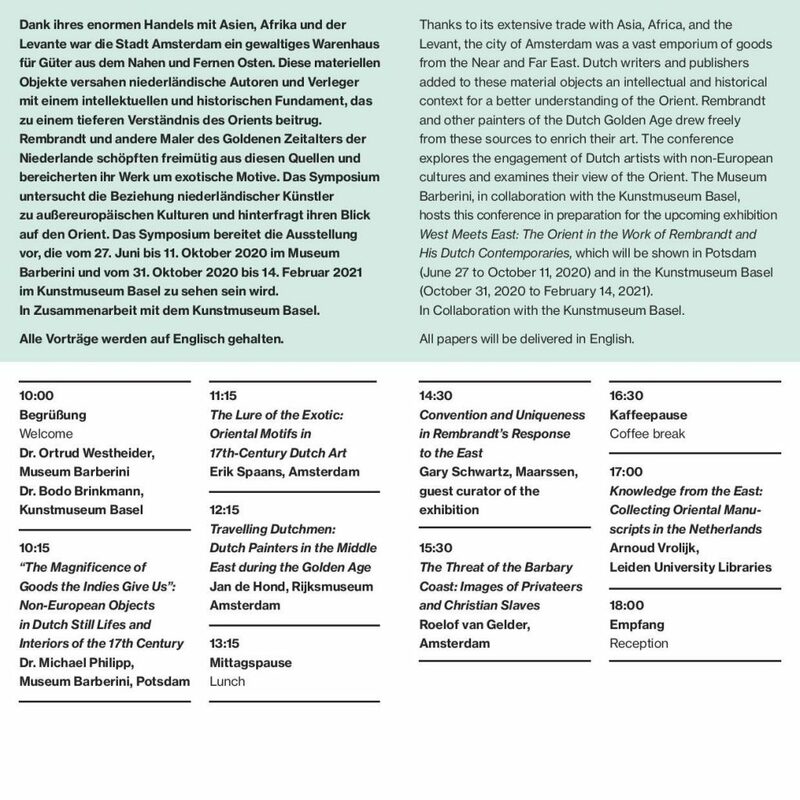 For the Museum Barberini in Potsdam and Kunstmuseum Basel I am organizing an exhibition next year with the title West Meets East: The Orient in the Work of Rembrandt and His Dutch Contemporaries. Museum Barberini is holding a symposium on the theme of the exhibition in June. Come one, come all. What follows is not for the faint of heart. Elections in the Netherlands are not very satisfying exercises in democracy. Last month I voted in elections for the Provincial States of Utrecht and the Water Board for Amstel, Gooi and Vecht. Although politicians and bureaucrats kept telling us how important the water boards are and why we should vote, I heard nothing about the specific intentions of particular parties with regard to policy. My vote went to a Maarssen guy in a non-party called Water Natuurlijk (Water Naturally), which garnered 3334 votes, losing out to the CDA (Christian Democrats), who got 3335 votes. How many seats each gets where and who sits in them is unclear to me. The election for the Provincial States was a disaster. Thanks to a detestable mistrust of the voter, comparable to the electoral college in the US, Dutch voters do not elect the upper chamber of Parliament directly. The members of the Senate are chosen by the members of the Provincial States (who are not bound to vote in any particular way, but these days always follow the party line), so that the provincial elections have heavy but non-representative consequences for the national Parliament. Election campaigns for the Provincial States always give rise to stupid discussions about why the media and voters pay more attention to national than to provincial politics. Of course they do, as long as provincial politics is in such unjust thrall to the indirect Senate election. The party of the candidate I voted for, GroenLinks (GreenLeft), came in third, after the VVD (People’s Party for Freedom and Democracy, calling itself Liberal, but actually Neoliberal and obstructionally conservative) and a new party called Forum voor Democratie (translating like what it sounds like, but being a climate-skeptical, anti-European Union, modern art-bashing, reactionary wrecking operation on the alt-right). The actual individual I voted for, Linda van Dort, was number 46 on the GroenLinks list, but she got more votes than all but two other candidates. Since GroenLinks got eight seats, she should have been elected to office, but she was not. The first eight names on the list were given seats, even though one of them received fewer votes than four others lower down, including van Dort. So what does a vote mean, will someone please tell me? Neither did anyone tell me whether Linda van Dort could actually have taken a seat in the Provincial States of Utrecht, since she is already Alderman for Public Space, Environment and Sustainability in the municipality of Stichtse Vecht, which has swallowed up Maarssen. Like the Water Board candidate I think I voted for (I’m not sure any more, I usually look for women living in Maarssen), Pieter de Groene, she too has been accused in the Stichtse Vecht township government of violating integrity standards. He was forced to resign as a D66 alderman, she is fighting the charges. I am telling you these futile facts in order not to dwell too much on the victory of Forum voor Democratie, which received the largest number of votes country-wide. Over my past half-century in Europe, I have convinced myself that extreme right-wing demagogues can always get up to 15 percent of the vote without serious damage to an otherwise healthy democracy. But now, in my adopted fatherland, the two parties that meet this description, Geert Wilders’s PVV (Partij voor de Vrijheid, Party for Freedom) and the Forum voor Democratie of Thierry Baudet, have risen to an unhealthy 23 percent. What makes it more disturbing is that the VVD, presently the largest party in the lower chamber of Parliament, has not spoken out against Baudet’s excesses and seems to be lining up to share power with Forum, as it has done in the past with the PVV. Next month I will be asked to vote in the election of a new European Parliament. This too is not a one-man-one-vote situation. Last time I voted for a candidate of D66 (Democraten 66 = why do Dutch parties have to insist they are so democratic and so much for freedom? Are they protesting too much? ), the able parliamentarian Sophie in ‘t Veld. But her party forms a “liberal and democratic” bloc in the European Parliament (Alliance of Liberals and Democrats in Europe, ALDE), including the VVD, for which I would never vote, but which is headed by Guy Verhofstadt, whose understanding of liberalism is closer – far closer – to mine than that of the VVD. I’m not sure that I will be keeping you up to date from now on. Congratulations on your 50 years+. I did not pick up on the longevity of your residence and marriage during or visit. thank you again for your hospitality. Ik denk (hoop?) dat onze self-appointed intellectueel Baudet een strovuur heeft aangestoken dat vrij snel zal uitwaaien. Ik houd het toch maar op Sophie (zat in Brussel bij Niek jr in de klas, doet er niet toe). Misschien helpt een zo zwaar mogelijk D66-contingent Verhofstadt om zijn groepering op een redelijk spoor te houden, cq te brengen.